New Yorker's criticized the city's management of last month's heavy snowfall. 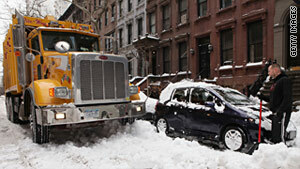 New York (CNN) -- Mayor Michael Bloomberg announced Thursday that some city snow plows will be fitted with global positioning systems in a pilot program meant to better track sanitation vehicles as officials brace for a winter storm. "It gives us the ability to check on the location and progress of our snow plows," Bloomberg told reporters, saying that the devices will be added to some trucks in New York's Brooklyn and Queens boroughs where heavy snowfall last month left many residents snowbound. The city will also deploy scout teams to transmit video images of neighborhoods back to City Hall during clean-up efforts, the mayor said. He added that John Doherty, Sanitation Department chief, has made management and personnel shake-ups in Brooklyn following sharp criticism for the city's slow reaction to the holiday blizzard. That response has prompted an investigation into whether sanitation workers intentionally delayed clean-up efforts over frustrations of demotions and citywide budget cuts. "These are only initial improvements," Bloomberg said. "Certainly not the last word on the subject." He said Department of Investigations Commissioner Rose Gill Hearn is also conducting an independent review over allegations of a slowdown. Joseph Mannion, president of the Sanitation Officers Association, said there was no coordinated effort to deliberately delay clean-up efforts among supervisors. The association later posted comments, saying: "When you look around your neighborhood and wonder what the heck happened with the City's snow fighting ability you don't have to look any further than City Hall." The heavy slow hampered morning commuters, delayed first responders and even prevented aircraft service personnel from reaching airports where 29 international flights were stuck on the tarmac for more than three hours, officials said. On Wednesday, Fire Commissioner Salvatore Cassano replaced the man who led the Emergency Medical Service after 170 ambulances became trapped during the blizzard. "This city will be better off with a different person in charge," the mayor said. The states of New York and New Jersey had loaned the city 35 ambulances to help reduce the backlog of emergency medical services requests during the storm. In one instance, a newborn died in Brooklyn after the mother waited nine hours for emergency responders, said Fire Department spokesman Steve Rittea. The National Weather Service has issued a winter storm watch for New York, New Jersey and Connecticut starting early Friday. Forecasters project between two and four inches of snow, with heavier amounts of snow expected over eastern sections of Long Island.